« The Greatest Commandment and Parable of the Good Samaritan. Audio Homily 2009. Parable of the Good Samaritan. The Greatest Commandment. 10 things. 1. 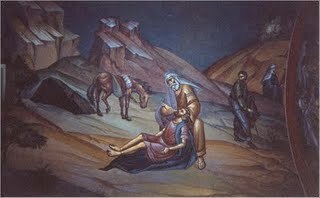 The Parable of the Good Samaritan is only in the Evangelist Luke's Gospel (Luke 10:25-37), and is read on or near the 25th Sunday after Pentecost. This is always very close to or in the Nativity Fast. The "certain man" is Adam and all his descendants – all of mankind. This parable is describing man's condition and the means of his restoration. “Binding up His wounds” symbolizes the self control that helps us to stop the hemorrhaging of sin. Christ helps us, not binding us against our will, but He helps us with self control. Whatever sin you have — you cannot name a sin that God will not help you to conquer. You cannot name one. This entry was posted on Monday, November 30th, 2009 at 12:00 am and is filed under Redeeming the Time. You can follow any responses to this entry through the RSS 2.0 feed. You can leave a response, or trackback from your own site.